Above postcard, circa 1920, kindly sent by Rory Kehoe. Also showing the "Fleur de Lys." Above postcard circa 1920. It is noted that the bike and sidecar in the picture almost certainly belonged to Mr. H. H. Camburn, the well-known photographer of postcards. The building gained a Grade 2 listing on the 16 January 1975, and describe it as follows:- C18 double span house. 2 storeys, 3 windows. Tiled roof. Tile hung 1st floor, brick ground floor. Late C18 sash windows with glazing bars, segment-headed, on 1st floor. Late C19 sashes on ground floor. 1-storey west extension, the near part C18 the right addition modern. On left return to Lower Green C19 casements on 1st floor, sash on ground floor right, and 4 panel door, with side lights and fascia board over, forming small shop front at left. 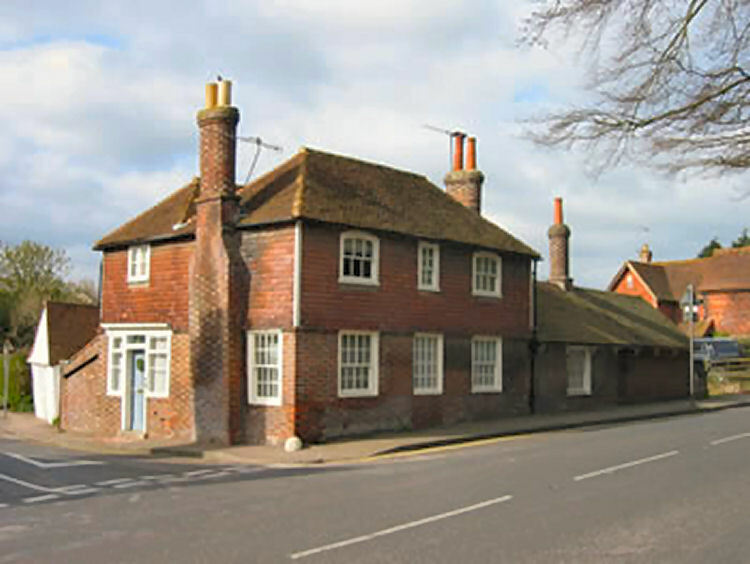 Old Brickmakers is on the west corner of Lower Green with the High Street and was formerly a public house called The Brickmakers Arms. It was built by Henry Fuller in 1841 on land leased from the Penshurst Estate. Henry Fuller was the proprietor of the brickworks and yard at the bottom of Kiln Lane. 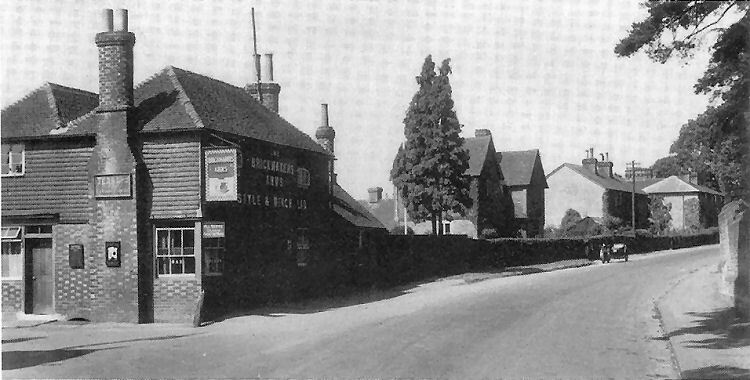 In 1921 it was sold as part of the Penshurst Estate properties in Leigh – it is described in the Sales Particulars (p.21) as “the well-known and fully licensed beershop” known as ‘The Brickmakers’ Arms’. It extended to an area of 25 perches. A the time of the sale it was let with other lands to Mr Lawrence Coomber on a yearly (25 March) tenancy. In the description it says “the house is of brick, weather-tiled, and tiled, and contains: four bedrooms, bar parlour, bar, tap room, scullery, two cellars, kitchen and sitting room. Old Shop and two WC’s. Company’s gas and water laid on. Good garden. Although it has been a private residence since 1950, the bricked up entrance to the cellars can be seen above the pavement on Lower Green. 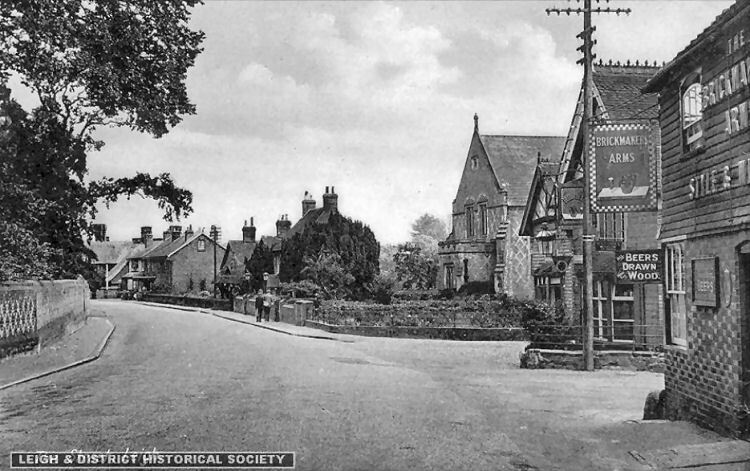 The pub entrance was on the High Street. At times beer was served from kegs on trestle tables outside the original front door so that men from the brick works could get a beer at lunch time. The house has unusual oval chimney stacks. Between the two World Wars the pub was run by Mr. Roots. At that time there was sawdust on the floor and spittoons containing sawdust in one of the two bars. The pub was a beer house only, with no licence for spirits. There was a hall in the garden which was used for dances and where teas were served and enjoyed by boys from Tonbridge School. The only food served was bread and cheese and pickles. Both the Brickmakers Arms and the Fleur de Lis were owned by Fremlins who, perhaps not unreasonbly, decided to close one of them. 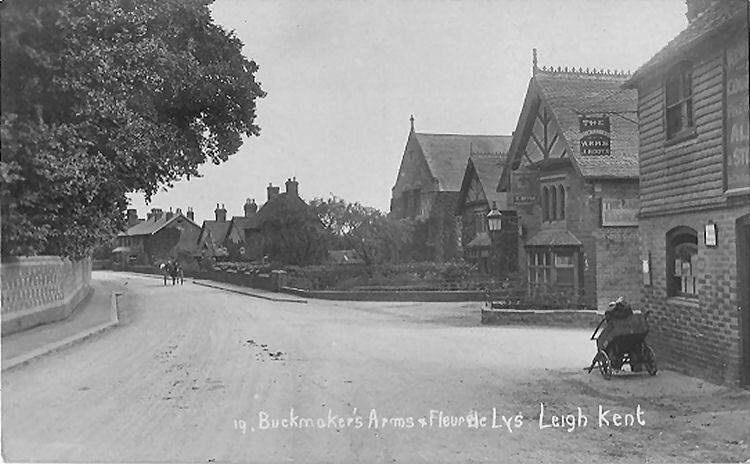 The Leigh British Legion was officially formed in 1946 in the bar of the Brickmakers Arms. Wine licences were granted to Percy Walter Seal, "Brickmaker's Arms," Leigh. From the Kent and Sussex Courier, Friday 30 December 1949. Every Boxing Day at the "Bricklayers' Arms," (sic.) Leigh, a battered board is unearthed and the game of dadlems is on. Perhaps you have never heard of it! How it is played? The answer is stand where you like. Throw as hard as you like. But mind the pictures on the wall! That's dadlems and Leigh men in this picture show you how it is done. From the Kent and Sussex Courier, 22 December, 1950. Dadlems day is but once a year. 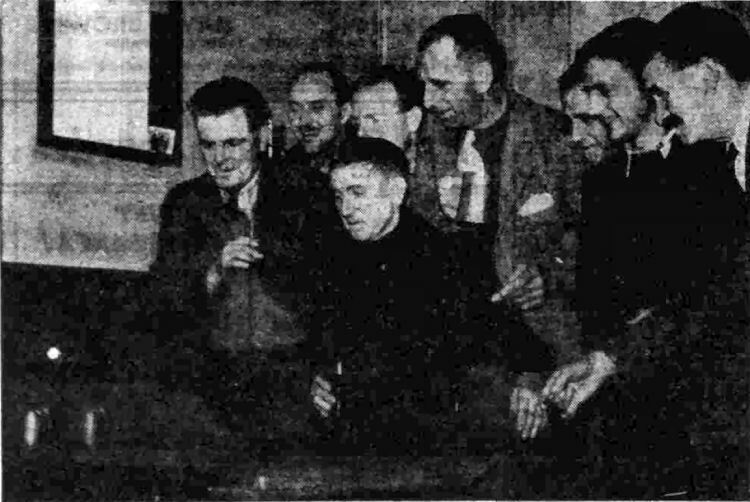 For nearly one hundred years the game of dadlems has been played at the "Brickmakers Arms," Leigh. But it to only played once a year, on Boxing Day. On Tuesday the dadlems board was produced for one game and then restored to its cupboard for the rest of the year. The origin of dadlems is obscure and apparently it is now only played at Leigh. Basically the game resembles skittles, as heavy pieces or metal have to be bowled over on a hard wooden board. This year’s champions at Leigh were Mr. A. Friend and veteran player Mr. A. Denton. Although the game attracted nearly 30 people on Boxing Day, one of the players, Mr. A. Baker, does not believe that dadlems would be popular all through the year. "At one time it must have been a popular game — but nowadays I think it would be called too noisy" he told the "Courier." "People seem to prefer darts." From an email received 24 November 2014. Abner and Margaret Parker had this pub in the censuses of 1891 and 1901, but not 1911. My great grandfather (Jeremiah Reader) boarded with them in 1901; he was an elderly milkman. By 1911 Jeremiah had passed away, and Abner seems to have taken over as milkman. I have also seen this pub referred to incorrectly as the "Duckmaker's," in the census of 1891. Local knowledge, further pictures, and licensee information would be appreciated. I will be adding the historical information when I find or are sent it, but this project is a very big one, and I do not know when or where the information will come from.